Pink, blue and amber leopard shoes adorn this fierce card case/business card holder. Adorned with crystals. Silver finish. Spotted Shoes Card Case. Also available as a mirror compact. Spotted shoes mirror compact. 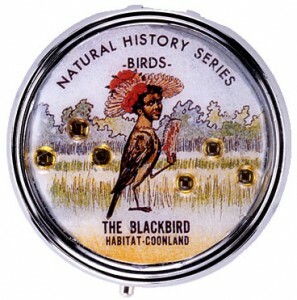 BLACKBIRD Vintage bird girl adorns round pillbox. Now take your vitamins, please.Silver finish. 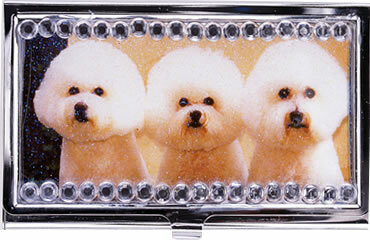 BICHON BABIES Three’s company—when it comes to adorable white fluffy pooches like these on abusiness card holder. Trimmed with rhinestones. Silver finish. As featured in ESSENCE magazine, the moody black and white image captures the legendary jazz singer Sarah Vaughn in a regal pose. 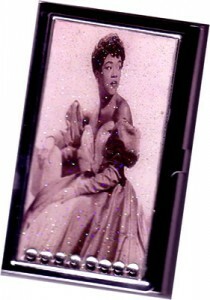 Card case has a silver finish and reflective mirror inside; embellished with Swarovski crystals. Leopards are forever. Here, a playfully chic scene of leopards chillin’ on a gold finish wallet case. Wallet case has a clip inside and is very compact–perfect for carrying lots of cards–metro, business, credit; money, condoms, receipts. Also available on a silver plated tissue box (has lid with mirror), or a mirror compact (request silver or gold finish under “special instructions” when processing order). RED HOT LADY Business card holder. Adorned with rhinestones. Silver finish. Holds other small necessities. 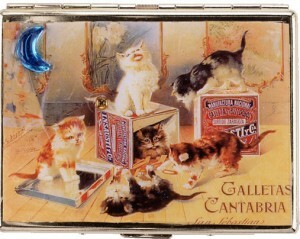 Also available as Long vanity case for tissues, long cigarettes, case contains a mirror. Remember all those hot days stylin’ for the asphalt jungle in the hopes that a beach date was around the corner? Well, so does this shapely 1940’s pinup senorita with salsa appeal whose image adorns a silver finish card case sweetened by crystal flower petal. 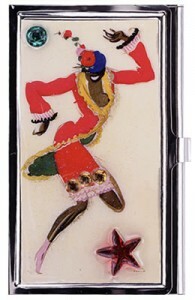 Sultry 1950’s senorita adorns silver finish wallet case embellished with turquoise moon crystal and several small pink crystals. This is a collectible item, limited edition, signed on the inside. Muy practical for carrying cards, driver’s license, money, condoms, etc. Silver finish; reflective mirror inside. Silver finish. Long vanity case has a mirror inside and a clip with tissues underneath it. Muy chic. Silver plated square mirror compact embellished with crystals. 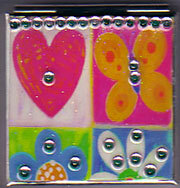 Hearts, flowers … and butterflies! The perfect mirrored compact to brighten your day with crystal highlights. 2 3/4″ square.